- using the Open Document button . 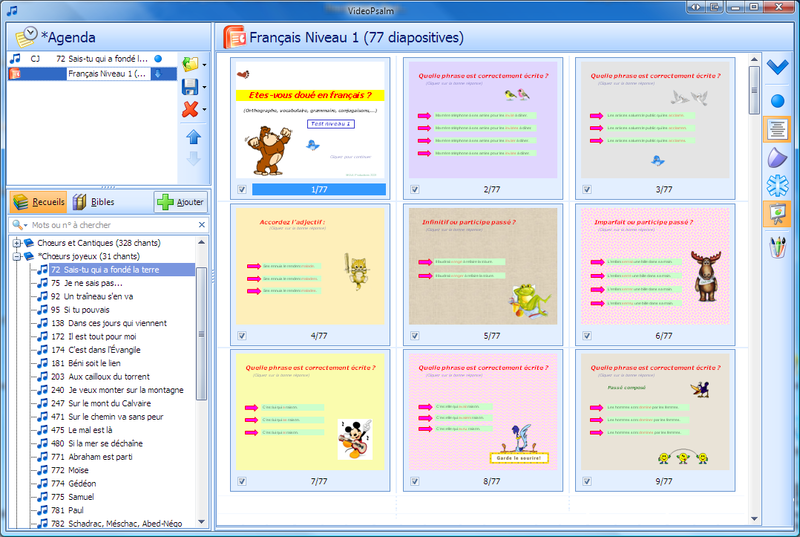 - dragging the presentation on the surface of the agenda from the desktop or a file browser. When loading a PowerPoint presentation, VideoPsalm builds thumbnails and displays the them in the slide panel. The extraction of the PowerPoint presentation thmbnails may take several seconds. Note that there is no visual indicator on the progress of the thumbnail construction. When you save an agenda, VideoPsalm stores a copy of the presentation, so you can move the agenda on another computer and be sure to have your whole presentation, with its settings. The PowerPoint presentation can be displayed in the same manner as the songs, using the mouse or the keyboard. At the end of the show, VideoPsalm continues with the following song. It is recommended to use Microsoft Office 2013. If you don't want to buy Microsoft Office 2013, install the Microsoft Office 2013 as a trial and you will be able to use its full features during 30 days for free. After the expiration of the trial period, you will still be able to use Microsoft Office, however some features will be disabled, notably you will only be able to use PowerPoint as a viewer, which is great. At the moment (as of version 1.15), VideoPsalm cannot display Impress or Open Office presentations.